Stunning and healthy! 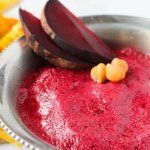 This Roasted Beet Hummus recipe is a bright update on a classic Mediterranean appetizer. Wash the beetroot and wrap in foil. Wrap garlic in foil separately. Place both foil packets in the oven, removing the garlic at 30 minutes, and beet at 1 hour. (Beet is cooked when you can pierce easily with a fork or knife). Allow all ingredients to cool completely. Peel cooked garlic and beetroot, and chop the beet into quarters. Place the garlic, beet chunks, chickpeas, tahini and lemon juice into a food processor. Puree with 1/4 cup olive oil. Taste and add a pinch of salt and/or cumin, if desired. To serve, scoop the hummus into a bowl, drizzle with olive oil and garnish.